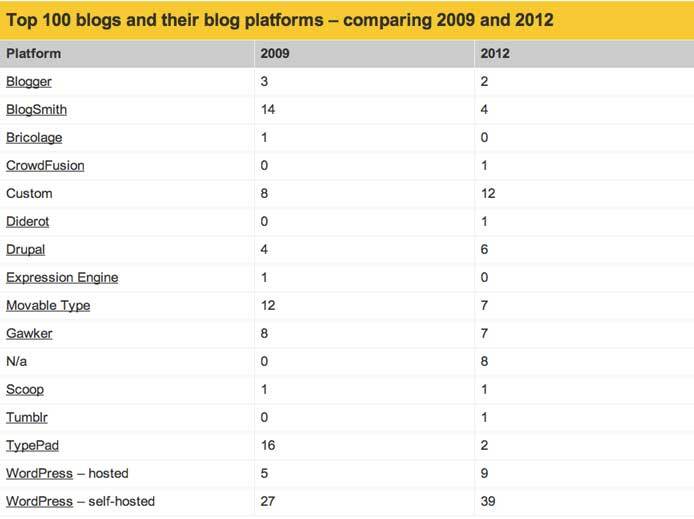 What blog platform do the best bloggers in the world use? WordPress is no doubt a very popular web publishing platform for blogs and other types of websites. But just how popular is it? We just completed a study and found that WordPress is in use by 48 of the top 100 blogs in the world. This is an increase from the 32 we recorded three years ago. Other developments since then include that custom blog publishing platforms are more common now, TypePad has all but disappeared from the top 100, Tumblr has made an entrance, and some companies really don’t want to spill the beans about what solutions they use. Posted on May 13, 2012 Author robotchampionCategories defaultTags blog, blogging, blogsmith, cms, content management system, custom, drupal, gawker, pingdom, platform, top 100, tumblr, typepad, website, wordpress, world3 Comments on What blog platform do the best bloggers in the world use?